AMHERST, N.Y. – Daemen College’s annual Scholarship Gala on Sept. 7 was a resounding success with nearly $30,000 raised for student scholarships. 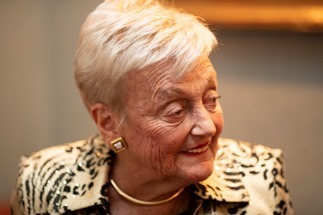 A long-time entrepreneur, leader, and philanthropist in the Buffalo Niagara region, Stovroff is a member of the Daemen Community Advisory Board and the college’s Joan Cooper Stovroff Endowed Scholarship for Women was established by her family in recognition of her exemplary career as a business leader. Olson announced at the gala that more than 84 percent of the campaign goal has been raised, an increase of nearly 10 percent since the public launch 12 months ago. “This campaign is crucial to taking Daemen to the next level of excellence, and it supports our vision for what comes next for our institution and for our students,” he said.